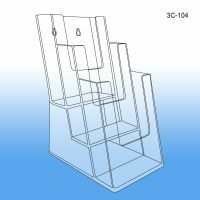 Our molded product display materials includes these very useful three tiered literature and brochure holders which are a very effective way to maximize space in a small area. Clip Strip Corp. accommodates two different sized brochures in our available versions. 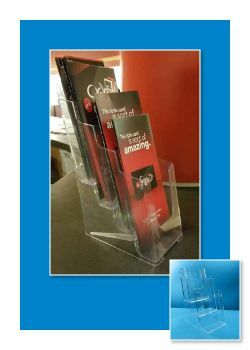 Our line up of acrylic brochure holders not only includes this 3 tier brochure holder, but also wall mount, free standing single and side by side pocket and business card holder versions. Let Clip Strip Corp., an American leader in point of purchase store fixtures since 1979, be a source you can trust for product merchandisers, sign holders, hang tabs, peg hooks, POP display construction components and literature and brochure holders.